To Sum It Up: Isla Martin never thought that the crush she’s had on Josh Wasserstein since their freshman year at the School of America in Paris would develop into anything more than that. Running into Josh in New York during summer break, though, marks the start of something for both of them that continues when they return to Paris for the school year. Soon Isla is living a dream, but with graduation looming for her and Josh, the two must figure out a way to stay together. Review: Anna and the French Kiss was one of the first YA contemporary romances I read shortly after I’d begun reading in earnest again as an adult. I remember being pleasantly surprised by how it told a sweet story that had substance to it. 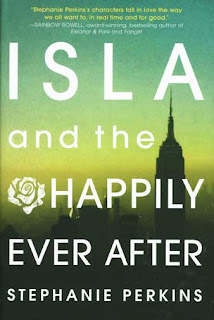 There’s a fine line between sweet and cloying, and with Isla and the Happily Ever After, Stephanie Perkins delivers another winning novel that warms your heart without getting sappy or melodramatic whenever the characters face conflict. Two things that I’ve especially loved about Anna, Lola and the Boy Next Door, and now Isla are the main characters’ interesting backstories and how engaging they are as narrators. They also strike an excellent balance between being characters you can’t help but root for and being realistically flawed. Even as some of Isla’s actions made me go, “No, no, no!” I couldn’t fault her for them because I completely understood her reasoning behind them. It’s just that I so badly wanted to see Isla’s fairytale romance with Josh reach an equally fairytale ending that it pained me whenever insecurity got the better of her. I think “fairytale romance” is an apt description of Isla and Josh’s relationship. It’s epic and sweeping and swoon-worthy. It’s about falling totally, absolutely, madly in love. It’s not fleeting teenage infatuation, either; what Isla and Josh have is the real deal, complete with the very real problem of what happens to them when they graduate high school. Josh is ready to take his drawing talents further, but Isla is unsure of what career path she wants to pursue. Perkins wields an expert touch with her writing whenever her novels take on a more serious tone, and I think that’s what sets her books apart from other YA contemporary romances. They’re just believable, from the characters to the story lines. Even contemporary fiction is, well, inherently fictional, but some books succeed better than others at immersing you so thoroughly in the story that at times you forget that you’re reading a work of fiction. Isla is that kind of book. Isla’s descriptions of Paris, Barcelona, and my beloved New York were absolutely beautiful and just one more reason to love this novel. Love stories don’t always agree with this stony heart, but all three of Stephanie Perkins’s novels have been notable exceptions to that. All in All: The charming story that began with Anna and the French Kiss comes full circle in this equally sweet conclusion.